Mitch Bromage, in action against Tonbridge Angels, returned to the starting XI yesterday. New signings, Ross Murdoch and Tommy Wood fired the Hillians to a massive victory away at Kingstonian. 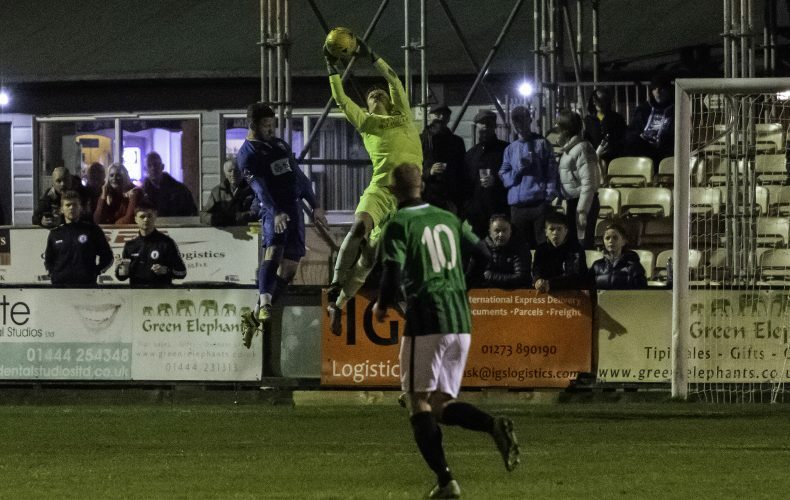 Simon Wormull made four changes to the side that lost 3-0 at home to Leatherhead last Saturday, with Mitch Bromage and James Richmond re-introduced to the starting XI – as well as debuts for new signings, Tommy Wood and Ross Murdoch. The opening 20 minutes were dominanted by the blustery conditions, with the wind hampering the chances of either side creating any opportunites. The conditions were evident for all the see, when Mitch Bromage’s goal-kick flew straight back into his arms, before his second effort flew back passed him for a K’s corner – funnily enough, that flew out for a goal-kick as well! The first real chance of the half fell to the home side, as Connor Smith couldn’t direct his free header on target. In the 30th minute, Bromage produced a fine save to tip Nathan Minhas’ effort over the crossbar. Just moments later, Tommy Wood found himself in the right place at the right time as he cleared Inman’s hooked effort off the line. The Hillians countered at pace, as Farrell Ryder found Ross Murdoch, who’s header could only find the hands of Tolfrey. Following a deadly quiet opening, the half had suddenly sparked into life. Aaron Smith-Joseph passed up a golden opportunity to open the scoring for the Hillians, as he skipped past three K’s defenders before slicing his effort wide of the target. In the 36th minute, Ryder had an even better opportunity to give the Hillians the lead, but couldnt’t sort his feet out as he poked his effort straight into the arms of Tolfrey from four yards out. In the 38th minute, the home side took the lead as Minhas drove his effort past Bromage and into the bottom corner. 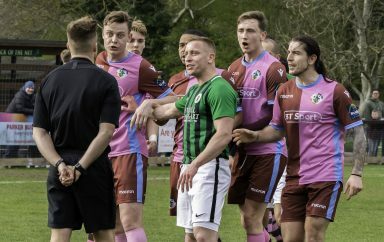 It was all go at King George’s Field, as just moments later, Smith-Joseph’s free-kick struck the outside of the post following a deflection off Tom Bird. In the 43rd minute, the Hillians deservedly found themselves level, as Ross Murdoch tucked home from close range for his first Hillians goal. However, the K’s had the last laugh of the half as Inman’s header caught the wind and looped over Bromage allowing Kalosczi to bundle the ball over the line. After the frantic end to the first half, the Hillians had to re-group and use the wind as a 12th man during the second. The first chance of the half fell to Tom Cadman, who’s 30-yard rocket flew agonisingly over the crossbar. The wind continued to play havoc with both sides struggling to piece anything together. That was until the 59th minute, as Ross Murdoch doubled his tally for the afternoon as he headed home from Wilson’s dangerous in-swinging corner – making it two a piece. In the 69th minute, Smith-Joseph showed Bird a clean pair of heels before finding Murdoch, but the forward passed up the opportunity for a debut hat-trick as he blasted his effort wide. That man Murdoch couldn’t keep out of the action, as in the 72nd minute he headed wide of the right hand post following Kipeya-Bonno’s deep cross. As the game headed into the final 15 minutes, it was impossible to call which way it was going to go. In the 79th minute, Smith-Joseph’s effort clattered back off the upright and straight into the thankful arms of Tolfrey. But just a minute later, the Hillians had the lead for the first time in the game as Tommy Wood also opened his goalscoring account with a controlled turn and finish past Tolfrey following some superb work by Dan Beck. The Hillians had 10 minutes remaining to hold onto a priceless victory. The home side threw the kitchen sink but the cavalry held firm. What a fightback! A massive victory on the road for the Hillians in a game dominated by the blustery conditions. The Hillians MOTM was awarded to Ross Murdoch, who produced a brilliant performance on debut – picking up a brace in the process. But every single man in a blue and black shirt were fully deserved of the plaudits. 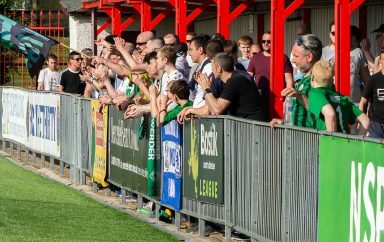 Thank you to every single one of you Hillians who travelled to support the club this afternoon – once again, absolutely fantastic! Next up, we host Margate.